First thing that comes to mind when the words super and shooter come together is that it's going to be a rough morning! Large indescribable shots waft through my head as I remember the days when I could handle much more alcohol than I can now. 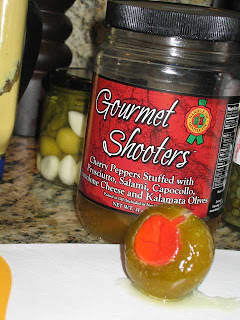 Fear not the heavy hangover, for these Gourmet Super Shooters, while super large, are crunchy, tasty and leave no reason to be grabbing for aspirin in the morning. Picture this (or just look at the photo below), a large cherry green pepper that is mildly spicy, stuffed with prosciutto, salami, capocollo, provolone and kalamata olives. Sounds wonderful, huh? It is, it is wonderful. Considering we found these delectable delights at Costco, I was pleasantly surprised. Costco and Sam's club often amaze me for their selections. I frequented Sam's Club when I owned a restaurant, the savings on paper products alone were worth shopping there. Sam's is geared more for the business owner while Costco was geared more for the slightly higher end consumer. I often shunned these business as I didn't feel they had the right quality food product I was looking for. But the truth is, if you look hard enough, you will find great products and great deals.